Most people have experienced the irritation of coming home to find a slip in their post box from the postal service saying that a delivery had been attempted but nobody was in. This often results in an inconvenient journey to pick up the desired article. One answer to this has been self-service post boxes and as they buy more things via the internet, Danes are increasingly embracing this technology; so much so that over the next six months PostNord, in collaboration with SwipBox and DHL, will be testing a system in Kolding with 200 boxes. 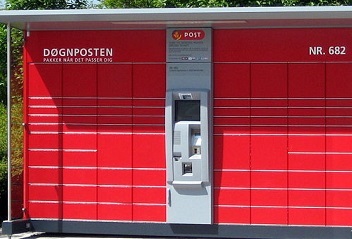 If this is a success, 10,000 self-service post boxes will be rolled out across Denmark. “We want to accommodate the consumer’s wish for self-service post boxes. We know that people want the convenience that they are close to their homes,” Peter Kjær Jensen, the administrative director of PostNord Danmark told TV2. One of the partners, SwipBox, has previously been one of PostNord’s main competitors, with several thousand boxes worldwide. Through working together the company estimates that by the end of 2020, there will be around 10,000 boxes in Denmark. “We want to put as many boxes up as there is postal volume to justify. If there is enough to warrant it we will put up a lot and if there is less, we will adjust accordingly,” said the firm’s administrative director Allan Kaczmarek. The new boxes will he placed on private ground, near flats, by public transport hubs and at the local garage and could cover every part of the country. “We want to create a new network for Danes offering a new level of accessibility. It could be at home or at work but it will feel more or less like a home delivery,” said Jensen.